Happy Winter! I just wanted to write a short post to remind you of all the fun things to do in the city this time of year. I have clearly been too busy to actually *do* any of them yet, but luckily, all the holiday stuff will still be here next week when things calm down a little bit, and the rest of the winter will last another few months so I hope to fit it all in. In the meantime, catch up on some of my favorite winter posts from last year. Go to the Radio City Christmas Spectacular! It will be the cheesiest thing you do all season, but it is still entertaining and impressive. I highly recommend going to happy hour beforehand. Finish your Christmas shopping at Holiday Markets around town! Aubrey and I hit up the Columbus Circle Holiday Market this weekend so that I could grab something for my mom's stocking. Luckily, I have finally finished my shopping (thank you internet) and won't have to return until next year. Check out the Holiday window displays! NYC's holiday windows are more well done art projects than any you could ever made in 5th grade. CK just posted about this year's windows on Empire Stilettos, so go there to check out her pics! Go to a park when it snows! Put on your Hunters, pull on your knit gloves, grab your chapstick and your camera and go exploring in one of the city's parks while it is snowing so that you can see all the fresh powder before it gets all dirty or damaged with other peoples' footprints. Bonus points if you build a snowman in Central Park, as was on my Winter To-Do list of 2010 and sadly remains uncrossed-out. Walk around Times Square before, during, or after New Year's Eve! It's pretty cool to see the setup and the cleanup of Times Square surrounding the ridiculous party there on December 31st. I have yet to experience watching the ball drop live, but I will be here for a few years, so I have some time to check this one off. Go ice skating! 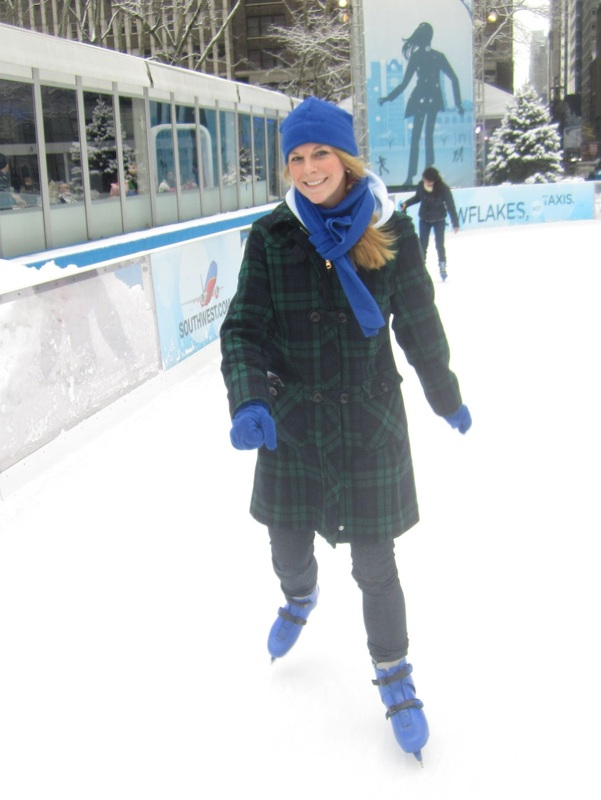 Ice skating at the Bryant Park pond was one of my favorite things this year. If you don't mind waiting in really long lines and being on the ice with tons of other people, you need to do this. I was lucky enough to do it as part of a charity event at work and did not have to wait or share the ice with thousands. Hope this opportunity comes again soon. Enjoy the winter and the upcoming holidays! I will write you soon, I promise. Then I have recently started to read “The Mole People” by Jennifer Toth, about the people who live in the tunnels under NYC. For the full effect, just as I only listened to the Beatles, Adele, Oasis, & BBMak while I was in London, I save this book and only read it while I am actually *in* the tunnels, of course while protected by the walls of the subway car around me. I really have NO IDEA what goes on underground nowadays as this book was written in 1993, but it is so incredibly interesting to read about these people who, at least when I was in third grade, were living several stories below Manhattan in actual little rooms and communities that they developed. I’m not saying I want to *live* down there or ever *go* down there, but it has been interesting for me to see how these people did it. I’m comparing it to my larger obsession with the Real Housewives of Beverly Hills and Jersey Shore which I claim to watch simply to see how different their lives are from mine. 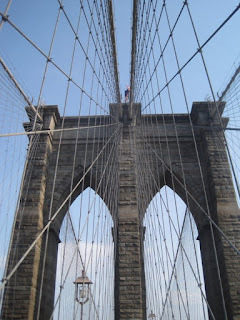 A few weekends ago, RG and finally I took the trek into Brooklyn to see the Transit Museum. Funnily enough, we actually ran into problems on the subway on the way there. We ran to catch the train from West 4th Street and then for some reason it wasn't heading into Brooklyn that day and only went as far as 2nd Ave. The conductor said we could catch the F train at that point but after waiting 15 minutes underground, we took a cab instead. We didn't get to the museum until almost 4 and the museum closes at 5, but we were told we had plenty of time to see everything we needed to, although we decided if we had to, we would come back since it is only $7 a pop, a true bargain in NYC. The museum is located in the old Court Street station and the entrance is virtually indistinguishable from a current and working subway station. There are two stars of the museum. One is definitely "Steel, Stone, and Backbone" - a historical exhibit about how the subways were actually built. The other star is the entire downstairs of the museum, which is full of old subway cars. It was cool walking through each car and guessing the decade and imagining what it would be like if the cars were like that today. They also for some reason had some current cars too, I supposed in case you don't actually take the subway normally, or if you just wanted to compare them right there. The ads and signage in the subway cars were one of the most interesting parts. I think overall that the museum is probably a lot more fun for children than adults, and there were tons of children running around and having a blast playing in all the buses and trains, but we still had a good time. I would actually disagree with the attendant who told us we would have plenty of time to explore everything, because we ended up skipping the ElectriCity exhibit for the most part and skipped the bus and the money train exhibits because we didn't find them very interesting. We would have needed another 45 minutes at least to go through those thoroughly. I also think the museum is probably most interesting to actual New Yorkers who spend part of every day underground and spend more time thinking about the subway (or is that just RG and me who do that?) than tourists who may not appreciate it as much. According to wikipedia, there are exhibits about the bridges and tunnels too, but we seem to have missed them. I would have probably really enjoyed that, especially the history and construction of bridges. We also didn't see anything about how they decided which lines go where, or where the stops should be, although I suppose it could be assumed it was based on population at the time of construction. And we never got our question answered about how long the subway stations all are. Maybe we need to take another $7 trip after all. One of the most essential "to-dos" in NYC is to walk across the Brooklyn Bridge. Whenever someone asks me what they should do with friends or family from out-of-town, I always suggest this as an activity. 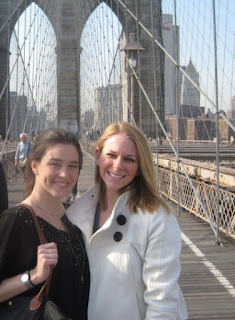 One of the first times Aubrey came to visit me (before she was a New Yorker herself), we walked across the bridge on a beautiful day in March. A few weeks ago, my parents and sister came into town on another beautiful day. 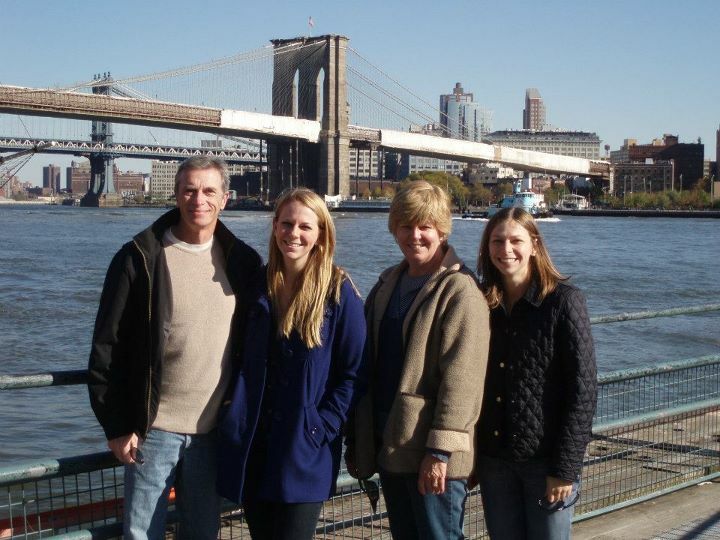 When I saw the forecast for the day, I knew we had to walk across the bridge as a family. Especially because someone on my mom's side of the family helped to build the bridge many, many years ago. I was under the impression that the start of the bridge was a lot closer to the seaport than it ended up being. We walked for quite some time, but eventually we found the start of the bridge and climbed on up. Once we got up on the walking part of the bridge, we were able to fully appreciate the construction, the views, and the history of the beautiful bridge ahead of us. The bridge is about a mile long and probably took us about a half hour to walk across. We of course got held up a little by some congestion of crowds taking photos since it was such a gorgeous day, but it was no where near as crowded as it was when Aubrey and I had walked across a year and a half prior. And it was definitely worth spending time up there, even with some extra people around us. 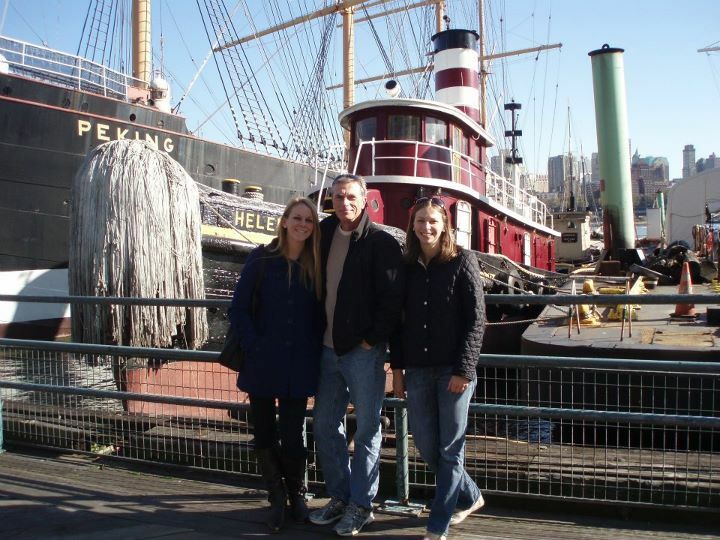 I'm really enjoying being able to show my family around somewhere completely different each time they come up to visit. My favorite day was of course when they came up and we went to Central Park and rowed boats on the pond, which happened to inspire my first blog post. But this day was a close second. Any suggestions for our next outing? Last weekend, I had the honor of watching over 45,000 runners race across the city in pursuit of finishing the NYC Marathon. 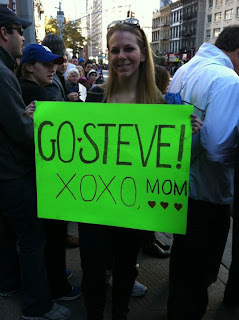 I was out of town last year for the marathon, and this was my first year watching on the sidelines which happened to be a perfect year for cheering. I knew a few folks running the race, including my fabulous frousin (friend/cousin) Emily, and my wonderful friend Steve (who I call my son...long story). 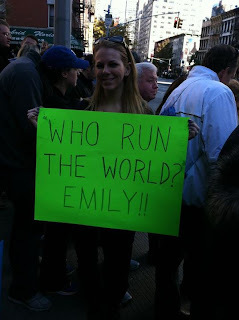 This was Emily’s first marathon ever, and she pumped me up for the last few months with her blog about training for the marathon for The Huffington Post (her blog about training/running is a lot more interesting than mine about watching so check it out) and our brunches and dinners after her runs in Central Park. Steve has run a few marathons but this was his first attempt at la crème de la crème. On Saturday night, my sister, Katie, and my good friend from home and new neighbor Aubrey decided to stay in and make signs for our runners. Our first art projects in quite some time brought a lot of laughter mistakes, and tears of laughter from the mistakes. We brainstormed what to write for hours, I wish that were an exaggeration. I rewrote my sign for Steve in pencil at least five times before finally diving in and then not even leaving room for what I wanted to write to fit properly. Aubrey wrote a creepy sign to Emily (“your ice bath awaits”) in cursive, unreadable letters. Katie was unhappy with her lowercase writing and the slogan we made her use on the back of her sign for Emily (“26.2 ain’t got nothing on you”). We also planned out where we were going to wait for our runners. Emily’s parents, siblings, and plus ones were going to be at 86th and 1st (in between the 17th and 18th mile) so we decided to go there, but a little earlier than the rest of the fam since Steve was set to get there around an hour and a half before Emily was to arrive (he had an earlier start). We managed to make our way to the front within a few minutes and started seeing the top runners almost right away. Already, I was blown away by the crowds there to support the runners. It was a day to embrace the side of New York that you don't get to see all the time, the New York that cheers on complete strangers accomplishing their dreams. You might think it would be boring to stand on the sidelines and cheer on thousands of random people, but we had the best time! Most of the runners have their names printed on their shirts or sharpie’d on their bods, so whenever we saw someone’s name, we shouted out personalized cheers. We kept telling them how awesome they looked, how much cooler they were than we were, and that they were doing such a good job. And whenever I saw someone with the name Steve or Emily, I used my signs, even though people were pretty perplexed as to why my grammar was off on Emily’s (it’s a Beyonce song), and why I had a son who was old enough to run the marathon (just a joke of course). I think I really missed my calling and should probably have become a professional cheerleader (minus the flips and short skirt). Of course, the best moments were when we actually saw Steve and Emily. After seeing Emily the first time, we all walked over to Central Park to see her again, a lot closer to the end of the race. It was fun to see everyone again who we had cheered on the first time without actually knowing them, including the two Howies, the man running with a tray of champagne glasses held up in his hand, and the man running with a shirt saying “for my mom”. There were a lot of runners who wore other peoples’ names or “F Cancer” on their shirts, which all made the experience even more emotional. I don’t even know how much money was raised by all of these people but I am so impressed by each and every one of them, both for the fundraising and of course for the feat itself. A marathon is not my style, but I am inspired to do *something* big and challenging and good for the world. I’m sure an idea will come to me soon. 1) I HATE being scared. At age five, my sister and I cried our way out of the Haunted Mansion in Disney World after waiting in line for two hours. The episode of “Salute Your Shorts” which features the spooky Zeke the Plumber traumatized me as a child. I couldn’t read Goosebumps books that featured ghosts in them. I had thoughts of dead people hanging out in my house a la “The Sixth Sense” seven years after watching the movie. 2) I HATE store-bought costumes. You are not cool in my book if all you do each October is go to the store and buy a packaged cop or bumble bee costume. MAKE YOUR COSTUME YOURSELF! When I do decide that I’m going out for Halloween, I start thinking (read: stressing out) about my costume in August – I’m not even kidding. So I think the two-month buildup of pressure I put on myself to have a better costume than the girl who paid $40 at Ricky’s is another thing that gets to me at Halloween. But when I do have a good costume (like Oscar the Grouch last year), I end up having a really good time. Each year, the place to be in NYC on Halloween is the Village Halloween Parade. 50,000 to 60,000 people walk in the parade every year as anyone with a costume is allowed to participate. The parade begins around 7 and ends around 10 and goes up 6th Ave, from Spring Street to 14th. I had seen the parade back in 2007 when I was on a work rotation, prior to my big move to the city. This year, RG and I found a good spot just half a block up from Spring Street on Vandam Street. We were about six rows back when we first got there but could still see pretty well. There was an annoying group of high school students in front of us “woo”-ing at every costume and yelling the same “jokes” to every Waldo – “Find a better hiding spot! I found you five times” – and making me feel really old for asking “who is Per-ott?” when someone came by with a “Perot for President” sign as part of their costume. But within an hour, that group left because they had had too many Bud Lights and all needed a bathroom, so RG and I achieved our goal of getting to the front. A float for the nightclub Pacha featured a masked DJ who looked a lot like Pauly D (of Jersey Shore fame), but we didn’t think it was actually him, until this morning when I read that he was there. I guess I can check seeing him off my list after trying to see him during Fashion Week when I was hanging out with Kim K.
My favorite costume was a transformers taxi cab. How cool is this guy?! Next year I am definitely dressing up with friends and strolling down 6th (unless there is another October snow – I hate snow *almost* as much as I hate being scared). PS, from 2015 - I never did dress up and do the Halloween parade...will someone please force me to sometime in the future? !